Why Won’t My Front-Loading Washer Drain? You hear the cycle on your front loading washer stop, so you head to the laundry room to put the clothes in the dryer, but you are greeted by the sight of water still in the tub. Why hasn’t the water drained out? Read on to learn about some possible causes and solutions. In some cases, you may even be able to handle the problem yourself and avoid a service call. Start by taking a look at the machine’s drain hose. If the hose is kinked, twisted or bent, your washing machine may not be able to drain properly. The hose also can become partially or fully blocked by a piece of laundry or other obstruction. Try removing the hose to check for blockages (disconnect it over a bucket to avoid a mess! ), and straighten any kinks or bends. When you replace the hose, make sure it is not more than 8 feet from the floor, as this can hamper drainage. Front-loading washers have drain traps that collect any small items that end up in your laundry (Legos or little green Army men, for example). The trap prevents coins, hardware and other small items from entering the main drain. This trap is typically on the front of the washing machine, so look for a small cutout at the bottom. Gently pry the cutout off, either by hand or with a screwdriver, if necessary. Next, remove the screw cap, using a container to collect any water that may leak out. Finally, slide out the drain trap and remove any items, then replace it securely. If your front loader has gone dead in the middle of a cycle and is completely full of water, it’s definitely worthwhile to check for a tripped circuit breaker or GFI, blown fuse, or — simplest of all — see if the washer wasn’t accidentally unplugged. If none of these options solves the issue, you may indeed have a mechanical problem. 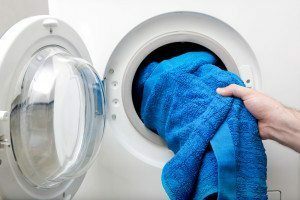 If the water won’t drain, it could be a problem with the washing machine’s pump, or it could be an electrical fault inside the appliance that has stopped the pump from doing its job. You may even have a defect in the lid switch assembly, which can lead the machine to believe its door is open. 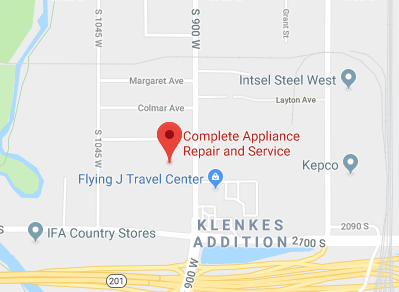 With any of these problems, a DIY appliance repair probably isn’t possible, which means it’s time to call an experienced technician from Complete Appliance Repair. Serving North Salt Lake and the greater northern Utah area, we specialize in quick, professional repairs to have you back up and washing in no time. Call us today if your front-loading washer is giving you any problems. This entry was posted in Blog and tagged appliance repair, DIY Washer repair, Front loading washer problems on December 28, 2015 by admin.